The origin of resources supporting metazoan biomass in rivers has long been a subject of debate. The river wave concept (RWC) postulates that the energetic basis of food webs varies along its spatial–temporal location with respect to flow pulses. According to the RWC, river flow determines carbon assimilation in food webs, but this may also depend on river geomorphology. However, studies testing this theory are scarce, particularly those from large subtropical rivers. To analyse the origin of fish biomass in areas of differing geomorphology, we combined stable isotope analysis with standardised measurements of biomass of a diverse fish assemblage along the lower Uruguay River. Furthermore, using 14 years of monitoring data, we tested for relationships between the biomass of species dominantly fuelled by allochthonic resources and the river flow. Fish biomass was dominantly allochthonous-derived along most of the studied sites. At all trophic levels, autochthonous-derived fish biomass was the highest in an upstream anabranch functional process zone (FPZ) (fuelling 54% of the total biomass), while allochthonous-derived biomass prevailed downstream, in the widest sections of an unconstrained lowland FPZ (fuelling 64–72% of the total biomass). Moreover, the dominant species that derived most of its biomass from allochthonous resources (Prochilodus lineatus) increased its biomass following flood pulses. 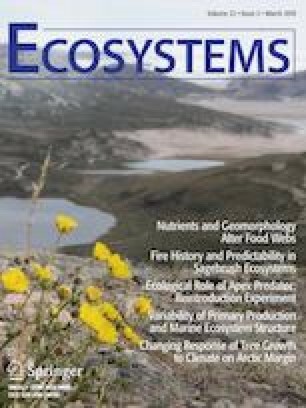 This study supports the RWC statements that, at a spatial scale, local river geomorphology affects fuelling sources for food webs (probably by determining contrasting resource availability scenarios) and, at a temporal scale, increases in the allochthonous fraction of biomass are driven by flood pulses. IGB, FTM, AD participated in the conception and design of the study. All authors conducted the fieldwork, coordinated by FTM and AD. IGB and SS conducted the laboratory work. IGB analysed the data and drafted the manuscript with the help of all authors. All authors provided final approval for publication. The online version of this article ( https://doi.org/10.1007/s10021-019-00370-0) contains supplementary material, which is available to authorized users. We gratefully thank the many students and researchers that helped with the fish monitoring sampling campaigns, namely Jukka Tana, Diego Larrea, Roberto Ballabio, Malvina Masdeu, Daniel Garcia, Emanuel Machín, Juan Manuel Martinez, Sebastian Serra, Joaquín Pais, Anahí López and Matias Zarucki. We also thank the artisanal fisherman from Las Cañas, Elbio Russo, and the wildlife park ranger from Nuevo Berlin, Angel Rosano for their constant support and collaboration with sampling and fisheries data. This research project was partly funded by the Scientific Research Sectorial Commission (Uruguay) (Project CSIC I + D_2016_577-348) and the National Agency for Innovation and Research (ANII) (Project ANII-FCE_2_2016_1_126780). From 2005, sampling campaigns were financed by the UPM pulp mill environmental monitoring programme; we thank Gervasio Gonzalez for logistics and data accessibility. IGB, AD, NV and FTM received financial support by the ANII National System of Researchers (SNI), and IGB also received financial support from a ANII scholarship (ANII PD_NAC_2015_1_108121).